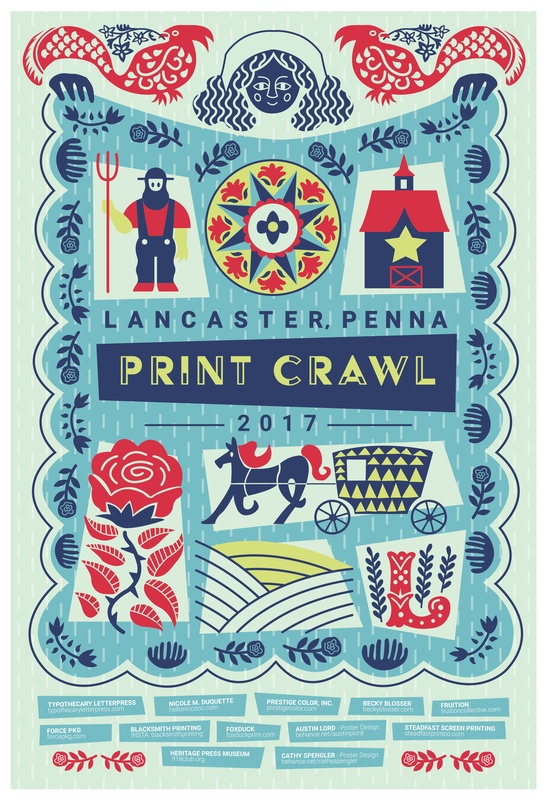 Approximately 400 First Friday goers visited all the stops during the first annual Print Crawl scattered around downtown Lancaster, and went home with a beautiful poster featuring iconic Lancaster City, designed by PCA&D students Austin Lord and Catherine Spengler! 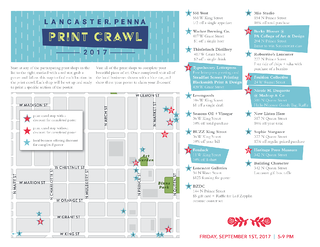 Austin, an illustration senior from Mechanicsburg, and Catherine, a graphic Design junior from Lancaster, created each of the eight sections on the poster, which were completed as participants went from stop to stop on the crawl, First Friday, September 1, 5 – 9 p.m. to get each section silkscreened, printed or stamped. Participants started the Print Crawl at any of participating print shops to get their poster and map. before following the map around downtown to each of the shops to complete your poster. Stops included screen printing, letterpress printing, stamping and vinyl graphics. Completed posters earn discounts or raffle entries at shops around town. See the list below. In addition to Austin and Catherine, other members of the PCA&D Community participated. Megan Zettlemoyer, adjunct PCAD professor and owner of Typothecary Letterpress, helped organize the event and will be hosting a letterpressstop on the crawl. Becky Blosser, PCAD professor, will be operating PCA&D’s screen printing stop on the tour in the Art Garden, across from the College. Nicole M. Duquette, PCAD alum and staff member, will be operating the stamp stop at Madcap.